As we observe the Thanksgiving holiday, we share excerpts from the first in a series of inspiring remarks from Wellesley alumnae from speeches and talks given during the launch of Wellesley's Campaign to celebrate, strengthen, and advance the Wellesley Effect. This speech by Vivian Pinn '62 is one of 16 videos now available on the College's YouTube channel. 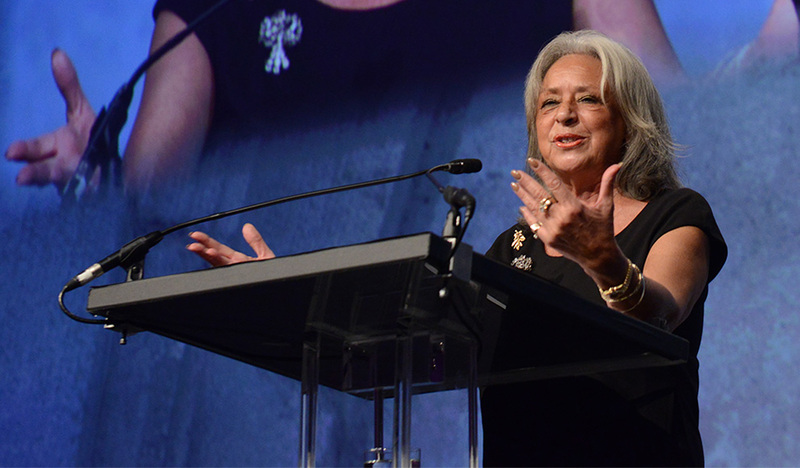 Vivian Pinn '62 never imagined how much the education, encouragement, and connections she found at Wellesley would shape her life journey and enable her to help countless women receive the medical care or career opportunities they need. She arrived on campus in the fall of 1958. "Little did I understand at that very moment that my life would be forever different, being a 'Wellesley Woman' would open doors and provide pathways for me that I would never have imagined growing up in Lynchburg, Virginia," Pinn said. Three of Pinn's four grandparents graduated from College. Education was very important to her family, she said, but her family was of modest means. "If Wellesley had not provided the scholarships, the student loan and work study program, I would never have been able to come to Wellesley, much less been able to graduate," Pinn said. Tragically, her mother was diagnosed with an inoperable bone cancer at the end of Pinn’s sophomore year. Pinn took a leave of absence to be with her then returned to Wellesley after her mother passed away a few months later. "Wellesley provided the additional financial aid I needed so that I did not have to drop out of school," Pinn said. "With the support of the deans and the faculty, and my friends, I got through that period of grief and I got my undergraduate degree and I am so appreciative of that." She was placed in a job with a transplant surgeon at Massachusetts General Hospital. "That was the beginning of the rest of my life, to do research to understand research, and again, I think back—that was Wellesley that opened that door for me." After Wellesley, Pinn headed to Medical School at the University of Virginia. "[The first day] I sat in the back of the room and I thought the rest of the women must have been late until the called the roll and I discovered that I was it. No other women, nobody else of color, just me and a class of guys," Pinn said, adding, "but you know, after Wellesley, you don’t worry about it, you go do it, because Wellesley taught us we can do what we need to do." Pinn went on to work in research positions at Harvard and Tufts then, in 1982, she was invited to chair the pathology department at Howard University. There, she was able to continue her work in encouraging young African-American students to pursue careers in medicine. She became the first director of the National Institutes of Health’s Office of Research on Women’s Health in 1991, serving there for more than 20 years. "I was in a position to help shape what has evolved in this country and around the world as concepts of what constitutes women’s health expanded … and to design and implement programs to promote careers and leadership for women in research and science," Pinn said. "I really think Wellesley helped me prepare me for that career… I know that is the case." She concluded by saying, "I am indeed very proud to be a graduate of Wellesley and I owe so much to this wonderful college… It is so often that I see women who have exceled in this nation or around the world in politics, in industry in academia, in the arts, as homemakers, as mothers, and I can look and say, 'She’s a Wellesley Woman' and then I think to myself and smile quietly and think, 'I’m a Wellesley Woman, too.'" This weekend, StoryCorps' presents the Great Thanksgiving Listen. Wellesley community members are invited to share their own stories through the StoryCorps mobile app. Download the app from Storycorps.me and email publicaffairs@wellesley.edu for the app login credentials. Then invite someone you care about to sit down with you for a conversation about your Wellesley experience and record your story.